In this second novel about Anastasia, the Krupnik family decides to move to the suburbs. Anastasia is against the idea based on her preconceived notions about suburban life, but even she can’t object when her parents find the perfect house. Once they move in, Anastasia and her brother, Sam, now a toddler, befriend Gertrude Stein, their elderly next door neighbor, whom Anastasia desperately wants to help make new friends and break out of her shell. Anastasia also deals with her complicated feelings for a boy in her old neighborhood, who has gotten the mistaken impression that Anastasia’s little brother is physically disabled. There is so much to like about Lois Lowry’s writing. Her dialogue reads like real conversation. Her characters have delightful quirks and flaws. She manages to understand exactly what it’s like to be an awkward twelve-year-old, but she makes it fun and not painful to read about the experience. I think what I especially like about this book is how the entire storyline is firmly grounded in family life. Contemporary middle grade fiction being published right now seems to focus more on school and friends than on family, so it’s refreshing when I read about a character whose parents are such an important part of her life, even if that character’s stories were published before I was born. I had some questions about the authenticity of Sam’s verbal skills and even his thought processes, since he doesn’t seem like a typical two-year-old. Still, I was mostly able to buy that he was just an advanced child, because of the highly intellectual environment in which he is being raised. 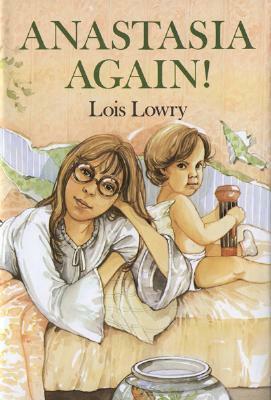 Also related to Sam, I appreciated that Lowry jumped ahead in time between the first and second books of this series, so that he was no longer an infant at the start of this book. I think Anastasia’s relationship to him is very interesting, and it might not have been so if there were several books where all Sam did was sleep and have his diaper changed. It’s also nice to see that Anastasia mostly likes her brother, but that there are also realistic moments of disgust with some of his toddler behaviors. Anastasia Again! does a lovely job of exploring the family’s move to the suburbs and of highlighting the relationships young people can develop with their elderly neighbors. The dynamic between Anastasia and Gertrude Stein is much more interesting than the superficial dynamics between middle school kids that turn up in so many books, and both characters stuck with me long after I finished the story.